"Apparently spätzle translates to little swallows in German, which makes a lot of sense when you consider their shape. These micro-dumplings cook in a just a few minutes, and are great plain with browned butter or topped with slowly braised meat." Place flour, egg, salt, cayenne, cream fraiche, and milk in a mixing bowl. Whisk together until batter drips slowly off the whisk. If batter seems too thin, add a bit more flour; if too thick, add a bit more milk. You can test the thickness using the smooth side of a cheese grater with fairly large holes. If a dollop of the batter does not drip through the grating holes, it's the right consistency. Bring a pot of salted water to a simmer over medium-high heat. Use a spatula to push a spoonful of batter through the holes of the smooth side of the grater into the simmering water. When dumplings rise to the surface of the water, they are done. This will take just a few minutes. Remove dumplings with a slotted spoon, and repeat in batches with remaining batter. Watch Chef John make the world’s easiest free-form pasta. If you're planning to eat this with butter, be sure to melt the butter in a skillet and cook it until it's nutty brown before you make the spätzle. Remove skillet from the heat until your spätzle are cooked. 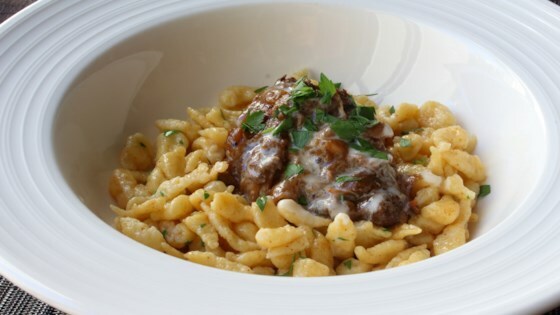 Turn the heat up to medium and cook and stir the spätzle until they are coated with butter. Sprinkle with chopped parsley and serve. Well, I thought when I mixed up the batter that it was too thick, so I thinned--oops!! They were way too soft--MY FAULT. The flavor is spot on--will make again--WITHOUT adding more milk. This made a fabulous side dish, I would double the recipe however. My family thought it was delicious. I made this to add to my favorite green bean dish. This is wonderful. It is definitely going into the recipe file. Cooking out of necessity here. Not quite as good as what I had served to me in Frankfurt but nonetheless pretty good. I'll make this again shortly.